Do you still remember the Breaking Bad TV series by Vince Gilligan? Although the series finale aired last September, I’m pretty sure that we wouldn’t be able to forget the story of Walter White. Walt was a chemistry teacher until he found out he had an inoperable lung cancer. He tried to find ways to provide for his family before his death and the way he chose is cooking and selling the world’s purest methamphetamine. However, his character becomes very dark by time and seems to be unsympathetic by the last season. Anyways, Walt is my favorite character in the series along with his partner Jesse Pinkman. The Breaking Bad series has gained a lot of attention during its 62 episodes in 6 years. Undoubtedly, this is among the greatest TV series in the history and specifically, it won 10 Primetime Emmy Awards and Golden Globe Awards for the Best TV Series and Best Actor. At Emmy 2014, Breaking Bad and its cast were among the biggest winners ever. Breaking Bad won Outstanding Drama Series award, Bryan Cranston (Walter White) won the Outstanding Lead Actor In A Drama Series, and many more. If you look for its rating on IMDB or Metacritic, you will be overwhelmed with compliments as this is the highest-rating series ever. Walter White now becomes an immortal character, he has a lot of fans and of course, I’m one of them. I always want to collect everything related to my hobbies. Regarding the series, I would want to have a collection of action figures of Walter and Jesse. 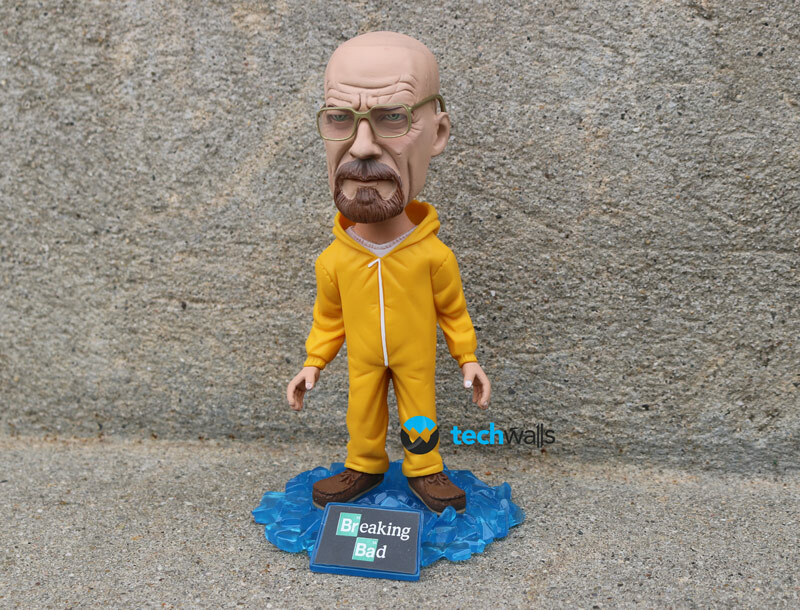 I looked around on Amazon and eBay and the Walter White Bobblehead by Mezco Toyz is the best figure at the moment. Let’s check it out. The figure looks amazingly good. I was very impressed with the details of the Walt figure. When I looked at the figure, I felt like I was Jesse Pinkman and he was angry with me. His face looks really scary with a lot of wrinkles on his forehead and a newly shaved head. I also love that his eyeglass is removable but I prefer to keep it there, you should be careful as the eyeglass could fall off anytime. 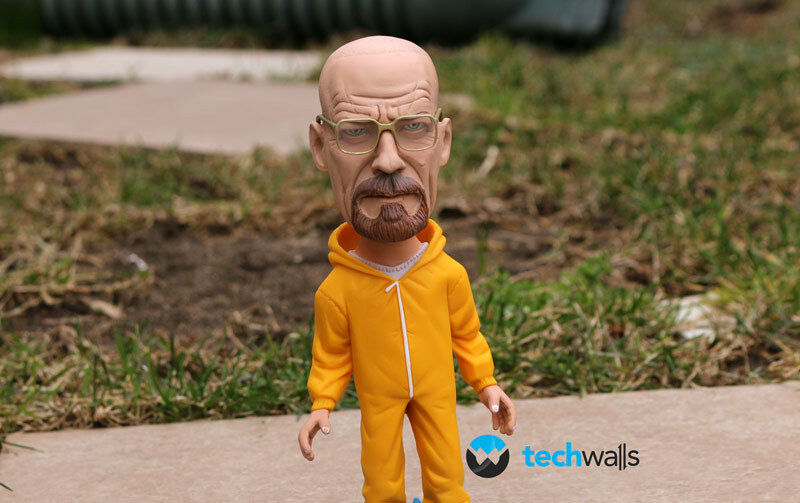 In this figure, Walt is wearing the familiar yellow hazmat suit, the expensive Clarks Wallabees shoes, and standing on his blue crystal meth. As this is a bobblehead, Walt’s head is flexible and it will be able to move around easily. I still see it slightly moving nearly 2 minutes after I knock the head. However, you shouldn’t think about putting this bobblehead on your car’s dashboard because it is 6-inch tall and it can block your vision. This one is designed to stay on your desk, that’s why you couldn’t find any sticker on the bottom. The build quality of this figure is excellent. Although it is built from some kind of plastic, it feels very sturdy with high quality of details and material. 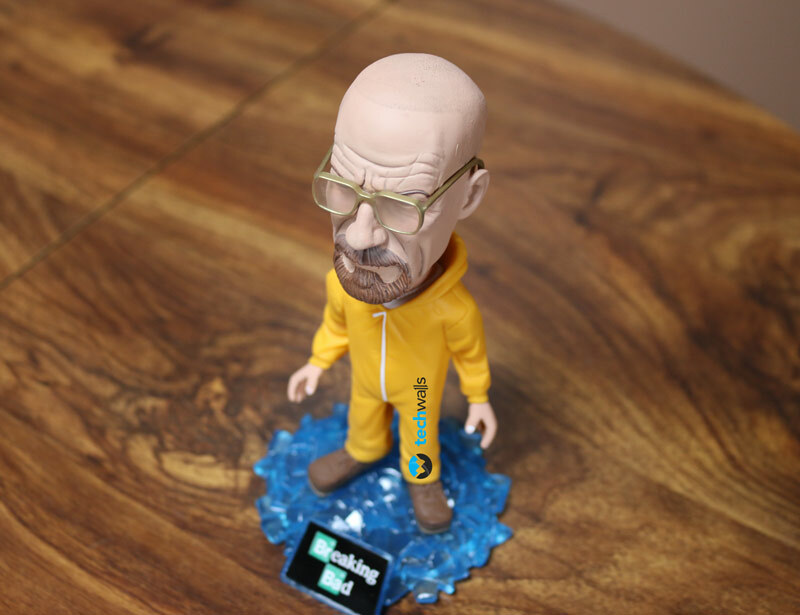 If you are a fan of the Breaking Bad series and want to keep something to memorize it, the Walter White bobblehead is absolutely a must-have item in your collection. You can now get it on Amazon for around $15 and it is worth every penny.